By hungry runner on December 8th, 2011 . Filed under: Blogs, Cupcake Ideas, Recipes . Right now I am really looking forward to the end of final exams when I can go home and spend time with my family baking and wrapping christmas presents! When I came across the Novice Chef’s blog I immediately wanted to bake everything and the delicious recipes only made me want to head home for the holidays sooner. 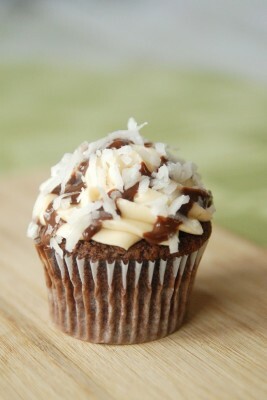 It’s hard to choose just one cupcake recipe to share with you when there are several to choose from in the Novice Chef’s recipe archive. 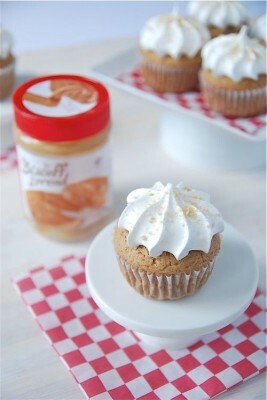 The first one that caught my eye was the Biscoff cupcakes with marshmallow frosting. My sister loves Biscoff! When we were in Belgium over the summer she went crazy for the speculoos ice cream so I know she would love these cupcakes. I personally would like to try making the Samoas cupcakes. Samoas are my favorite Girl Scout cookie and I have attempted homemade bar verisons of the cookie but have yet to try making a cupcake version. The cinnamon vanilla cupcakes with candied ginger also sound perfect for the holiday season but what about something a little different? Something like chicken and waffle cupcakes? Yes, the Novice Chef has a recipe for chicken and waffle cupcakes! I have lived in the south for over four years now and have yet to try chicken and waffles but I know people do enjoy the unique combination. 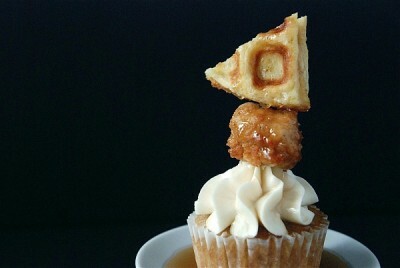 I think I wouldn’t be able to resist trying chicken and waffles if they were in for form of a cupcake! I do like maple syrup which is the cupcake and frosting flavor so I might like these breakfast, dinner, dessert combo cupcakes. I think that cupcakes in pretty cupcake liners are the best presents to give and receive during the holidays and I love your Ideas! I will use them this year.